The incident took place around 6.30 pm when the car was going towards the Akshardham temple. Initial investigations reveal that compressed natural gas (CNG) leak at the back of their Datsun Go car led to the fire. Huge plumes of thick black smoke could be seen in the visuals of the burning car. 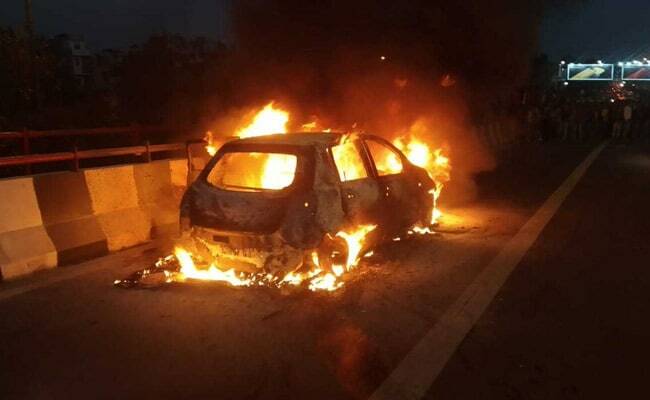 A 35-year-old woman and two of her daughters were burnt to death after the car they were travelling in burst into flames at east Delhi's Akshardham flyover on Sunday. Thick black smoke could be seen in the visuals of the burning car. The victims were Ranjana Mishra and her daughters Ridhi and Nikki. Her husband and a third daughter survived the blaze. As the fire spread, Rajana Mishra's husband Upender Mishra, who was driving, managed to get out of the car quickly with one daughter in the front seat. The bodies of his wife and the other two daughters in the back seat were charred beyond recognition. "We will conduct further investigations to figure out the cause. The husband is in a state of shock", Deputy Commissioners of Police (East) Jasmeet Singh said. Mr Mishra said he doesn't know what happened and how the car caught fire.